Tomato paste packing machine can automatically finish all processes, from measuring, bag making, filling, sealing, marking, cutting and counting, which largely reduces labor cost and improves working efficiency in large-scale production. Moreover, our ketchup packaging machine is specially designed for automatic packaging of liquid and viscous fluid state with scientific design and high efficiency. 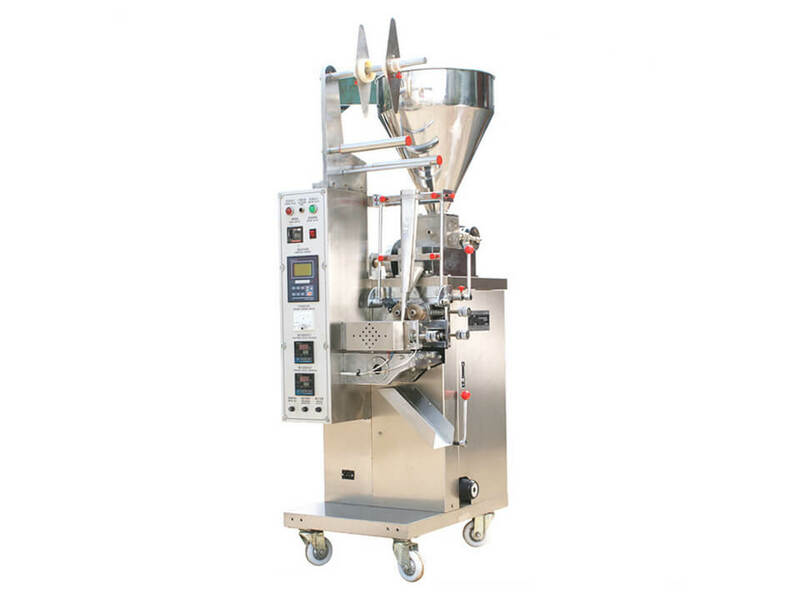 Therefore the vertical liquid packing currently has been adopted by a wide range of paste packing manufacturers in the food industry, medicine, chemical industry and etc..
1. It is a vertical type packing machine characterized by compact structure, small floor space, easy moving, and operation. 2. It is made of all stainless steel, stable, hygiene and healthy. 3. Fine packaging performance, low noise, clear sealing texture and strong sealing performance. 4. PLC control panel system, colorful liquid crystal display screen, English display screen, digital control box. 5. 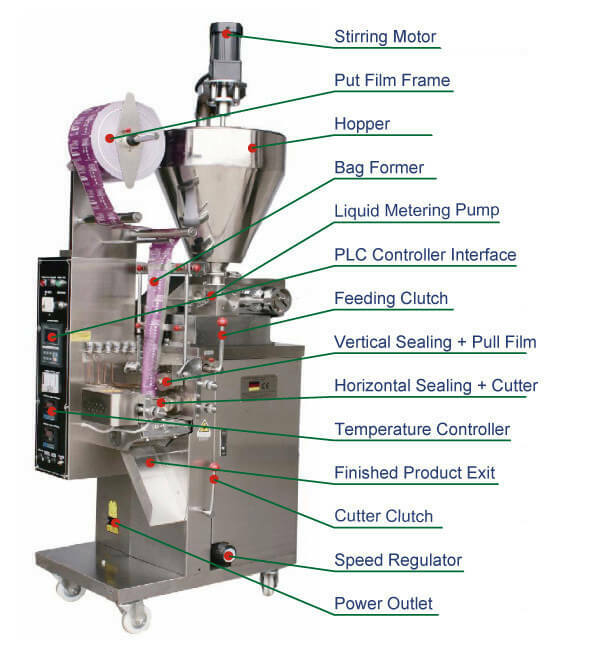 The parameters of bag length are set at the display setting unit, then the control system will automatically optimize and match the operation parts to achieve best packaging speed. 6. Reliable computer testing system to ensure the complete logo on the packing bag and intelligent temperature control by the temperature controller to make heat balance better. 7. It is available for packing tomato paste, sauce, paste, liquid, butter, and other liquid and viscous fluid state. ♦ PCL control system: it is responsible for the packing machine’s stable operation and adjusting parameters without stopping the machine. ♦ Frequency charger: bag length can be set and cut in one step, saving time and film. 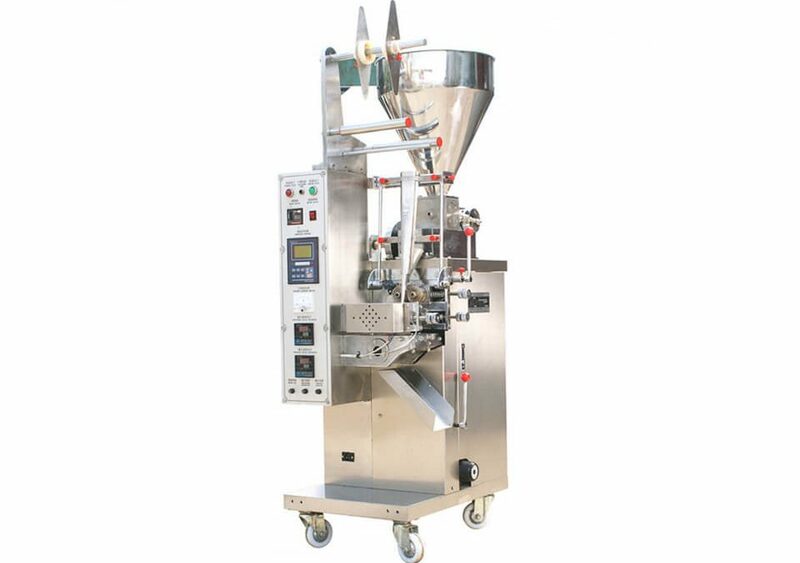 The vertical liquid packing machine is suitable for automatic packaging of paste foods, medicine and chemicals, such as pesticide shampoo, and body foam bath lotion, facial cream, ingredient oil, vinegar, soy sauce, fruit sauce, tomato ketchup and honey, etc. ♦ Three sealing forms are available including three-side sealing, four-side sealing and pillow type sealing. ♦ The packing materials used in food packing process should be compound packaging materials featured with heat-sealing and anti-leakage like polyester, aluminizing, polyethylene nylon thin film and etc..